Call of Juarez: The Cartel looks to be more Call of Duty than Call of Juarez. Scheduled for release this summer on the 360, PS3, and PC, the newest game in Techland's Call of Juarez series will bring the franchise into the present day. 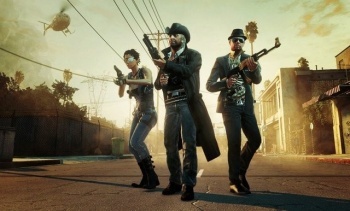 Ubisoft claims that the players will embark on an "immersive and mature story" that "brings the best elements of the Wild West to a new and modern setting." Based on the title and that Juarez, Mexico is listed as one of the settings, I don't think I would be too bold in believing drug cartels will be featured prominently. Caroline Stevens, EMEA Brand Director at Ubisoft said of the game, "Call of Juarez: The Cartel is an action-packed shooter game with a strong story, interesting characters and a wide variety of gameplay options. The game will bring the best elements of the Wild West into modern times with a very gritty and relevant plot." Retooling the Call of Juarez series to work in a present-day setting seems like an attempt on Techland's part to distinguish its game from Red Dead Redemption, understandable due to that game's wild popularity. With that game remaining very popular, trying to compete with it as a straight western game would likely pose extra challenges to The Cartel's success.